Where Does Snoring Originate From? In a sea of anti-snoring products, it’s often difficult to make a decision when all companies promise to put an end to your snoring. There are literally hundreds of product to choose from including nose cones, chin straps, mouthpieces, special pillows, and nasal strips to name a few. How does one go about choosing the best product to put an end to their snoring? Each product is unique and performs the function of preventing snoring in a different fashion. There’s no one-size-fits-all snoring solution, meaning that one product may work for some but not all. The key to choosing the right product is to first determine the type of snorer you are. Which Type of Snorer Am I? Snoring typically originates from one of two areas – within the airway, just behind the tongue or in the nasal area. Snoring most commonly originates from the airway. Knowing which type of snorer you are will be helpful when making a product selection. Release your tongue and try once again to create the snoring sound. Of the three types, airway snorers are usually the most common. The reason why snoring originates in the airway is that while asleep, the airway often becomes narrowed as our tongue relaxes and falls to the back of the throat. When this occurs, it creates resistance and as air moves past and it, this causes loose tissue in the airway to vibrate and generates the sound of snoring. While there are several possibilities of why this occurs, being overweight and age are two common factors that influence snoring in this area. 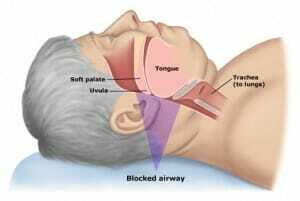 Extra fat, particularly in the airway region, places pressure on the airway which causes resistance. For this reason, simply losing a few pounds can help to reduce or eliminate snoring. As we age, the tongue muscle and muscles within the airway become less tone and are more likely to fall backward and create resistance. While we can’t turn back the hands of time, a mandibular advancement device (snoring mouthpiece) or Tongue Stabilization Device (TSD) can help. 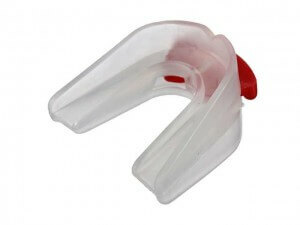 A snoring mouthpiece helps by holding the jaw forward which tightens the airway and prevents snoring. Open mouth snorers are less common in comparison to airway snorers. The sound of snoring is generated when a person breathes through their mouth instead of through their nose. As air moves in and out of the mouth, it causes the uvula, tonsil and other airway tissues to collide with each other and creates the snoring sound. In this case, the solution may be to encourage nasal breathing by using snoring chinstrap, mouthpiece, or a combination of the two which can be highly effective. Nasal snorers make up the least number of snorers. This occurs when the nasal passages become blocked, often by nostrils that collapse while sleeping. There are other possibilities that may cause nasal snoring such as a deviated septum or nasal polyps which require a visit to your physician. Other times nasal snoring occurs due to a cold or allergies. When performing these three tests, you may have noticed that you were able to generate the sound of snoring in all three instances. It’s possible that your snoring originates from multiple locations. In this case, you may want to start with one product such as nasal strips and then try a mouthpiece if your snoring doesn’t diminish. You may find that using a combination of products such as a mouthpiece and chinstrap or nasal strips and mouthpiece provide the best performance. 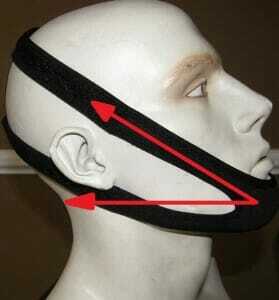 Chinstraps work well to help keep the mouth closed while asleep. They can also be used alongside a mouthpiece to prevent it from falling out at night. When used by their self to hold the jaw forward in order clear the airway, some have reported good results although using it for this purpose is usually not ideal. In the battle between the chinstrap and mouthpiece, the mouthpiece is usually the better choice as it tends to perform well for both open mouth snorers and airway snorers. In the battle between the chinstrap and nasal strips, there is no clear winner as each product targets a different type of snorer. When deciding between these two, refer to the tests above to determine which type of snorer you are. If a nasal snorer, nasal strips or nasal cones are going to be the ideal product to choose. All others may want to choose either a chinstrap or mouthpiece. 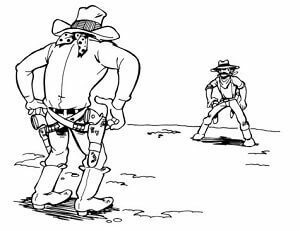 Once again, when trying to decide between either nasal strips and a mouthpiece, it’s important to first determine which type of snorer you are. A mouthpiece is not going to be effective if you are a nasal snorer and vice versa. Choosing a snoring solution is not always easy when there are so many to choose from. By first deciding which type of snorer you are, you can save time and money by purchasing the right product that will effectively solve your snoring problem. While there are many different types available solutions, mouthpieces, chinstraps and nasal dilators are the most popular. Of the three, the snoring mouthpiece is the most popular because they solve the most common source of snoring. They also have more clinical research backing them as an effective means to control snoring. Even choosing a mouthpiece is not easy because there are over 30 different manufacturers to choose from. This review website will help to take some of the guesswork out of choosing the right mouthpiece to meet your needs. Snoring Mouthpiece Vs Snoring Chinstrap -Which One Is Better? Next post: Foods that Cause Snoring – Is Your Snoring Linked to What you Eat? Previous post: Snoring – Does it Actually Put You at Risk of Cancer?